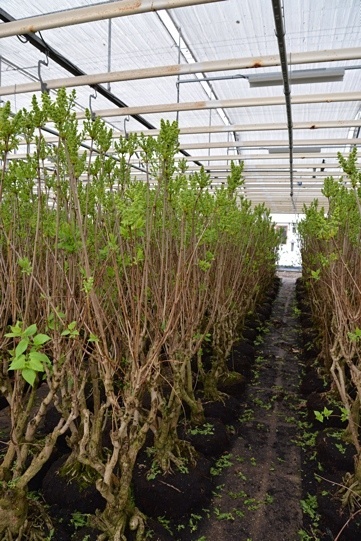 To say that our visits today to the Flora Holland auction, a major exporter we use often at Flower School and a 100 year old lilac farm were mind blowing is an understatement. Coupled with the jet lag and too much wine at lunch, my head is literally spinning. Thursday is the quietest day at the auction, which means maybe 15 millions stems are sold as opposed to 20 million. 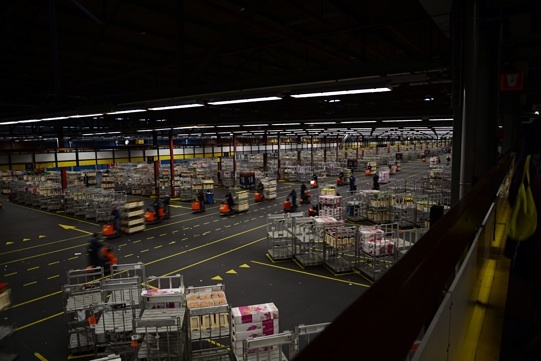 The Flora Holland company is owned by the growers, over 6,000 of them. There is so much product it’s hard to photograph because its all packed together in trolleys that are wheeled in front of the buyers who rapidly purchase the lots they need at the best possible prices and thousands of stems are sold in seconds.We were given a fabulous tour by a staff member and I highly recommend a visit if you are in the flower trade. The logistical systems, rigorous testing for quality and vase life and the principle that the 3rd party auctioneers level the playing field for growers large and small by dictating the minimum prices based on supply and demand are completely fascinating. It also takes a lot of the romance out of flowers, they are a commodity like any other produce here. The offerings were pretty basic-hydrangea, fillers, roses, tulips but again it’s the quiet day. For the NYC florists, the big Wednesday plane loads are bought at auction Monday/Tuesday. Our group then crossed the street where the trolleys of flowers go via a refrigerated conveyer to the major export companies for sorting, packaging and then travel. 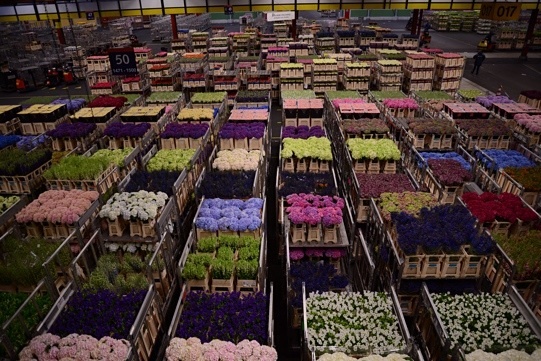 We saw the vast cold room facility and saw all the blooms destined for the US customers. We saw thousands of perfect hydrangea, super closed peony and what seemed like millions of tulips. The exporters all test the flowers for quality as well. Our group of floral designers and enthusiastic hobbyists didn’t want to leave the cooler but we eventually had to lest we get run over by one of the hundreds of good looking Dutch guys trying to pack up orders. I did feel like I was cheating on my beloved Dutch guys on 28th St.
Our next stop was in a residential area of Aalsmeer city, the lilac and viburnum farm. I have visited some US growers and I was expecting an open couple of acres with plants. This farm is compact, efficient and a lake divides the two growing areas. 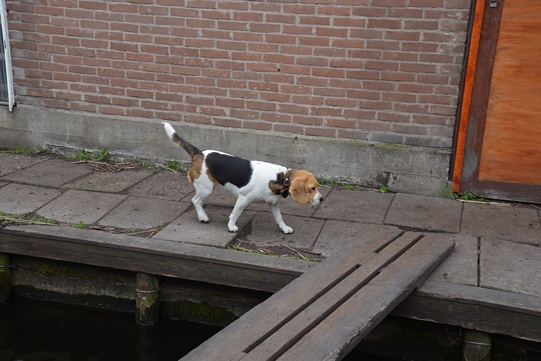 A series of buildings, greenhouses and tiny canals are used for the currently growing plants while the plants that have been cut wait in small fields to be shuttled across the lake by flat boats and rested for 2 years before they will be bloomed again. The plants themselves are not dug into the ground but rather rest on beds of rich black soil and in some of the houses they are given water every hour. Only 7 employees tend to 120,000 plants each year and each flower is sorted by hand number of heads, stem length and quality. A machine cuts the stems to length and binds them. Then they are sleeved and sent to auction and direct exporters daily. The owner & grower grew up doing this, his grandfather started the farm and he took over from his father. It was incredibly charming and impressive at the same time. They produce over a million stems each season and rarely replace plants. Their soil comes from the lake and they graft plants to 80 year old root stock. Most surprising to me was the efficient use of space, how they can grow more in smaller houses, it takes no time to move around the property and that they only grow two types of flowers. They prefer to specialize in their plants rather than diversify crops. Together with two other farms, this groups supplies 25% of the market supply and for you florists this lilac is carried at Dutch Flower Line, Harvest, G Page, 28th Street Wholesale, DV and I’m sure Mayesh and Florabundance. I will never look at lilac the same way. 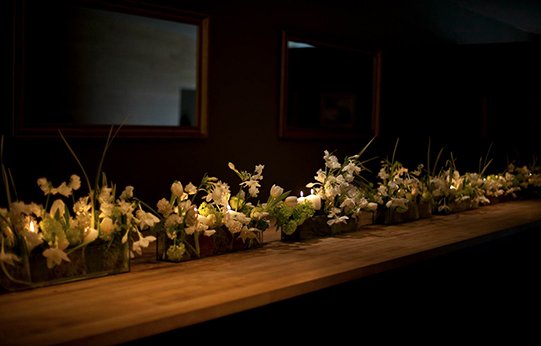 I have been fascinated with the process of flower distribution since I started designing. I sometimes feel prices are too high for some wholesale flowers but when you see the number of hands that touch each stem and move them you start to understand where the price is impacted. The standard of quality from the grower down ensures really beautiful products. We wrapped up our long day with a fabulous lunch at Restaurant De Kas which grows their own veg and herbs in greenhouses on site and an evening cocktail class using floral infusions at our lovely College Hotel. Tomorrow we buy flowers, have a workshop in a 150 year old garden filled with Dutch heirloom varieties, shop for vases and flowers for a little wedding at the Hotel that Matthew Robbins is designing for a lucky couple and a boat ride to visit the lilacs and other fields on the other side of the lake. Time to rest up. I’m very excited that in just 2 short weeks I’ll be on my way with the study abroad Holland & Paris trip with Flower School NY. Our guest master teacher is Matthew Robbins and I couldn’t be happier to take a few classes with Matthew and our Parisian teacher Christian Tortu. Honestly the trip couldn’t come at a better time. I’m desperately in need of some new inspiration and between the flowers of Holland and the fashion of Paris I know I’ll come home refreshed and excited. Our wedding season kicks in to high gear in May as soon as I return. I believe that no matter how long you’ve been practicing your craft or how of the moment and trendy your designs are there is always something to be learned. I choose to take classes with any designer whose work I find interesting even if it’s not my style or what my clients are asking for. Trends and styles change and I think it’s great to be well versed in different design styles. What artist or designers do you admire and whom would you like to study with? 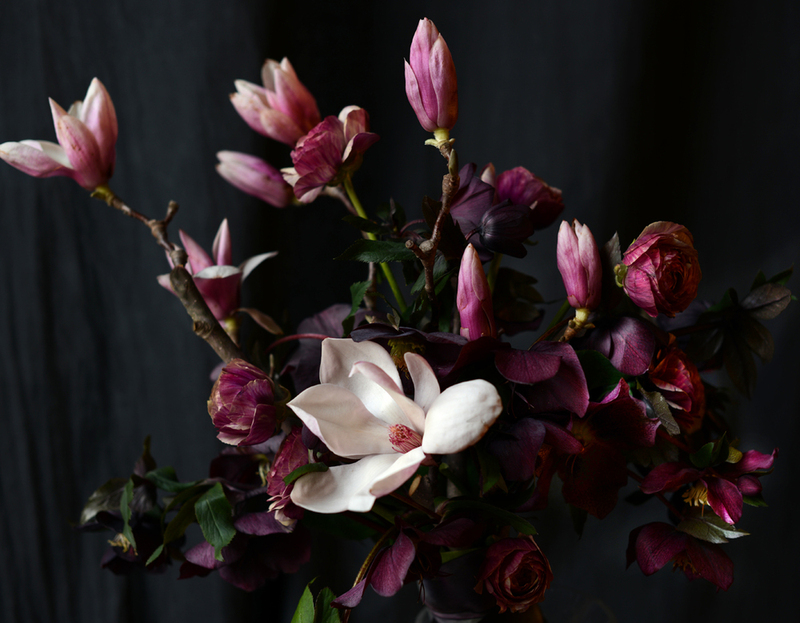 So, you want to be a florist? My friend Eileen of Flower School NY and I both believe that “florist” is going to be the next “chef” as far as career choices go. It seems everyone wants to be a floral designer these days which is exciting and also sometimes a little frustrating. Don’t get me wrong, choices and competition are great for the industry. 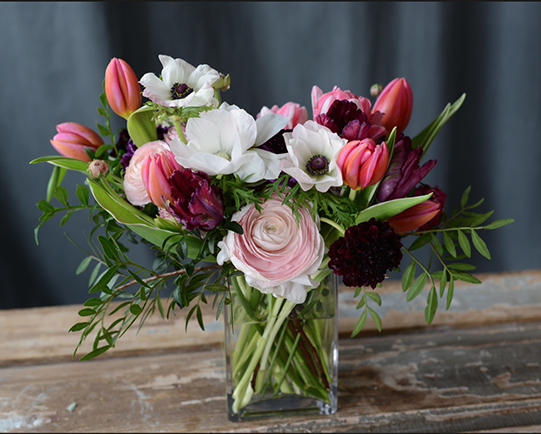 The onslaught of new forward thinking florists around the country are rapidly changing the 100 year old standards of the old school family florist and the wire services. It challenges growers and suppliers to be more creative as well ensuring better products and more choices for us as designers. But, it’s really helpful to know that being a floral designers is not all picking wildflowers in a field in cute Hunter boots. It’s a little less glamorous then most would believe and a lot messier. 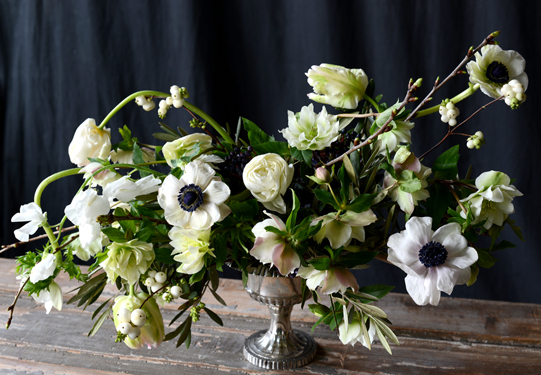 A great way to take a look into running a floral business is the Flower Shop series at Flower School NY. We get into the specifics of what your business is going to be about, pricing your work, making a profit and marketing your brand. The next class is 3/25-3/26 and you can register here.